Make Sure. The Right Firm For Your Case. Make sure the law firm you choose treats you as a person, not as a case file. Think about it. Will the law firm you choose treat you as a file number or as a person? Will you be known by your file number or by your name? Some law firms want to talk about how large they are. Some law firms want to talk about how many attorneys they employ. But do you ever get to talk to those attorneys? Are you only talking with a case manager? Are you only talking with a receptionist? Some attorneys want to talk about the money they spend on a case but is that what they really spend on the typical case? Our experience with clients who have left larger firms and allow us to work for them is that they were only talking with case managers—or in some cases only talking with the receptionist about their case. We pride ourselves on communicating with our clients, treating them the way we would want to be treated, returning their calls within 24 hours, and working to obtain the best results for them even if it requires extra work on the client’s case. We understood a long time ago that maximizing the recovery for the client meant that we would also maximize the recovery for our firm. But it goes deeper than that. We have a saying in our office: Do what is right for the client and the rest will follow. This means: Do the right thing for the client and the success for the client will be the success for the law firm. This has produced some great results for our clients and for our www.FightingForFamilies.com firm. Even on difficult cases. 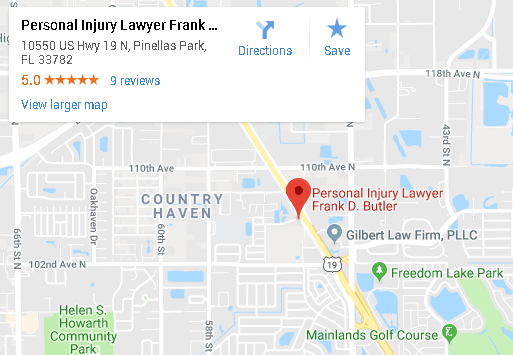 (See our $1.72 million verdict in April 2017 in Pinellas County.) Insurance companies know which law firms file suit and which law firms will only mostly just accept whatever the insurance company offers. Advertising law firms need to keep cases turning in order to afford to keep advertising. At FightingForFamilies we do not do billboards. We do not do TV. We do not do radio advertisements. We do not do Facebook or Twitter. We want our focus to be on our clients. Frank D. Butler, Esquire is an attorney who has practiced for 25years and only worked for claimants—that means he has only worked for the people and not for insurance companies. Frank D. Butler started the FightingForFamilies law firm 20 years ago to represent people and not the insurance companies. We don’t do answering machines. We don’t do phone trees to get to our attorneys or paralegals. Isn’t that annoying when you have to work your way through several selections instead of the business just answering your phone call with a real person and getting you to the right person you need? No answering machines. No phone trees or mazes. Real people. Real professionals working for you. If this is the type of treatment you would like to see in your attorney, give us call. We will answer the phone. We will talk with you about your case. We are ready to help you right now.